Delicate crystal beading and luminescent pearls add extra allure to the T-strap silhouette of this Badgley Mischka “Honey” embellished sandal, available in a shimmery dark pink satin. An adjustable ankle strap with buckle closure and a padded footbed ensure this style will be a favorite long after the big day, too. $125, from Nordstrom (multiple locations, including downtown Seattle). The Badgley Mischka “Gigi” pointed-toe flat makes for a beautiful bridal look thanks to a scalloped lace-inspired design, light-catching crystal details and perfectly sweet ivory hue. $185, also from Nordstrom. An oversize, pearl-embellished buckle adds just enough wedding-day glamour to Kate Spade New York’s “Broadway” mule flats, which are crafted from napa leather kissed in shimmery gold and feature a luxurious goat leather lining. $278, from Kate Spade New York (multiple locations, including The Bellevue Collection). An elegantly embellished bow takes center stage on this adjustable T-strap sandal from Italian designer René Caovilla. Also featuring the designer’s signature glittered outsole, this sweetie is perfect for showing off that big-day pedicure. $995, from Neiman Marcus in Bellevue. Make a statement with the pointed-toe “Powder Puff” satin mule from Aquazzura. Perky and playful with its signature puff, the Italian-made slip-on also features a 0.2-inch flat metallic heel for a boost of style. $650, also from Neiman Marcus. 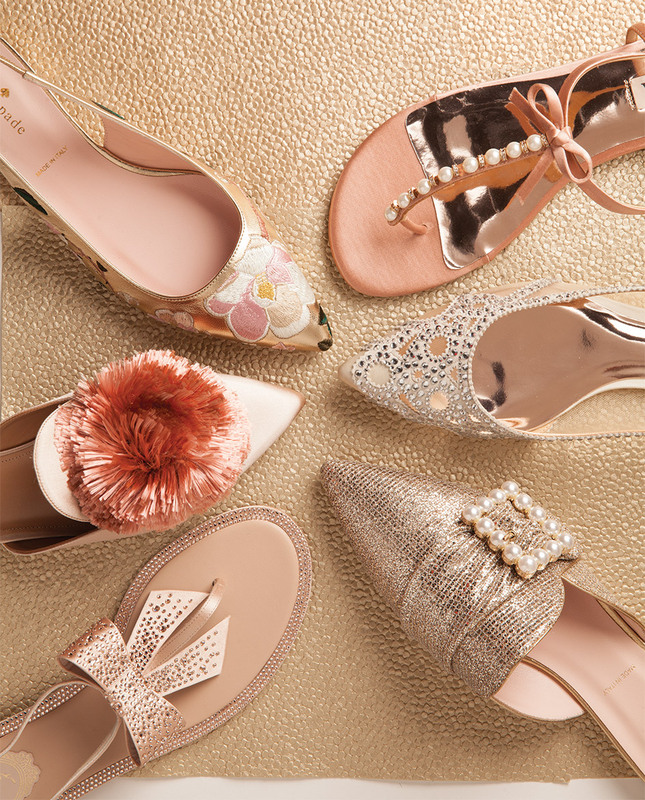 The exquisite “Barnie” pointed-toe sling-back flat from Kate Spade New York boasts opulently embroidered magnolia flowers that beautifully complement its gold linen fabric and low stacked heel. $298, also from Kate Spade New York.